Urged on by a historical impulse I don’t quite understand, I put on the proper clothing and ventured deep into the archives of YouTube to see one or two of my earliest videos of fine jazz I had created. A place where one could sweetly recline, alone or in duo. Now I have a better camera and a wide-angle lens. No doubt the gentleman sitting right in the middle of my viewfinder will come around on my next video gig, but you get used to him. And Kevin and friends continue to enrich our lives. The video has its cinematic limitations, but its soul is huge. Blessings on all the fellows herein. And Art Hickman too. I first met jazz pianist / composer / singer Jesse Gelber in the early part of 2005, when he was playing a Sunday brunch gig deep in Park Slope, Brooklyn, and was impressed by his music, his wit, and his imagination. Soon after I met his wife, Kate Manning, and heard her beautiful focused singing. We’ve crossed paths infrequently in the last decade, but I am pleased to be able to tell you about their musical — set in the early part of the last century, in New Orleans, in Storyville. Kate has written the book and lyrics; Jesse, the music and story. I didn’t know when I first met Jesse that he was a “serious” composer, but since then he has won an ASCAP Foundation’s Morton Gould Young Composer Award for his opera, and has arranged music for Itzhak Perelman and PBS. And here I thought he was simply an inventive musician — praised by Kevin Dorn, Craig Ventresco, and Tamar Korn. You can learn more about this project here — and, if you are so inclined, support it. To quote Sammy Cahn and Saul Chaplin, every nickel helps a lot. And this is the production’s website, where you can hear such enticing songs as MID-COITAL MUSINGS (MONEY ON THE TABLE); WE HAD TODAY; IF IT FEELS GOOD, IT’S GOOD. You see a general trend, I hope: this is an officially hedonistic musical, and we could use more of those. The story — in brief — is this: the musical follows Cora Covington, a young prostitute in Storyville, the fabled New Orleans red-light district, who falls in love with Apolline Albert, a beautiful Creole woman. Cora draws Apolline into a life of prostitution at one of the district’s most extravagant brothels, servicing the city’s wealthiest and most powerful men, and run by the notoriously cold Madame and voodoo priestess Marie Snow. When Apolline’s husband Joe returns from up North and wants her back, a desperate Cora will do anything to keep her from leaving. She commits a terrible crime, for which she then seeks redemption. In a world where love is a transaction, can it ever be given freely? 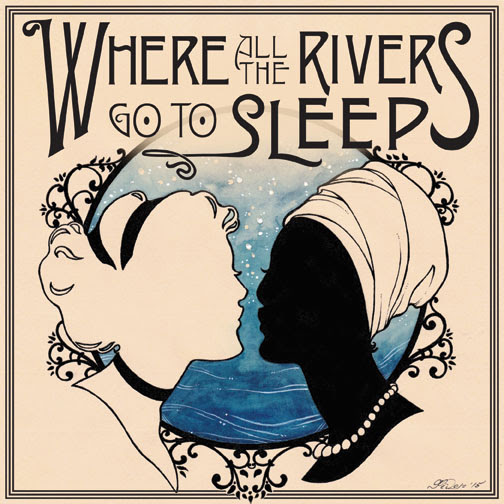 Ordinarily I have to be lassoed to a musical newer than 1936, but I trust Gelber and Manning’s artistic instincts, so I will be at the July 18 performance of WHERE ALL THE RIVERS GO TO SLEEP at the New York Musical Theatre Festival. It’s a concert performance, with a twelve-person cast and twelve-person orchestra. Since this is JAZZ LIVES, let’s start with the orchestra: Peter Yarin, piano; Andrew Hall, string bass; David Langlois, washboard; Nick Russo, guitar and banjo; Benjamin Ickies, accordion; Charlie Caranicas, trumpet; Matthew Koza, clarinet; Jake Handelman, trombone; Josh Henderson, Eddie Fin, violin; Sarah Haines, viola; Emily Hope Price, cello. And the cast, under the direction of Tony nominee Randal Myler and the musical direction of Dan Lipton (The Last Ship): Carole J. Bufford (Broadway By The Year, speak easy, Body and Soul) as Cora, and Ann McCormack (West Side Story 50th Anniversary World Tour) as Apolline, with Jacqueline Antaramian (Dr. Zhivago, Coram Boy, Julius Caesar), Kenny Brawner (Kenny Brawner is Ray Charles), Damian Norfleet (Show Boat, Ragtime), Brynn Williams (In My Life, 13), Amanda Castaños (Spring Awakening), Mariah MacFarlane (Nice Work If You Can Get It, American Idiot), Ryan Clardy, David Lajoie, Michael Lanning, and Erika Peterson. Here is the link to buy tickets for the Saturday, July 18 performance at 8 PM and the Sunday, July 19 one at noon. Performances will take place at PTC Performance Space, 555 West 42nd Street, New York City. I’m told that tickets are going quickly, and since this is not a huge space, I know it’s true. That Sunday’s version of The EarRegulars was Jon-Erik Kellso, trumpet; Matt Munisteri, guitar; Scott Robinson, bass saxophone; Attila Korb (our friend from Hungary) trombone. This version, so sweet and tender, reminds me of an unissued Seger Ellis side from 1929 with accompaniment from Jack Purvis, apparently doubling trumpet and trombone — a rare masterpiece. Even the faint annoying tinkling of someone’s smartphone a few barstools away in the beginning of this performance did not ruin the mood. The Ear Inn is a sacred place. I hope you’ve been there and can continue to support this beauty.